The United Nations Buffer Zone in Cyprus is a demilitarized zone, patrolled by the United Nations Peacekeeping Force in Cyprus (UNFICYP), that was established in 1964 and extended in 1974 after the cease fire of 16 August 1974, following the Turkish invasion of Cyprus, and the de facto partition of the island into the area controlled by the Republic of Cyprus (southern Cyprus save for the British Sovereign Base Areas) and the Turkish Republic of Northern Cyprus in the North. The zone, also known as the Green Line (Greek: Πράσινη Γραμμή, Prasini Grammi; Turkish: Yeşil Hat), stretches for 180 kilometres (112 miles) from Paralimni in the east to Kato Pyrgos in the west, where a separate section surrounds Kokkina. The zone cuts through the centre of Nicosia, separating the city into southern and northern sections. In total, it spans an area of 346 square kilometres (134 sq mi), varying in width from less than 20 metres (66 ft) to more than 7 kilometres (4.3 mi). The line is also referred to as the Attila Line, named after the Turkish code-name for the 1974 military intervention: Operation Atilla. Turkish forces built a barrier on the zone's northern side, consisting mainly of barbed-wire fencing, concrete wall segments, watchtowers, anti-tank ditches, and minefields. Some 10,000 people live in several villages and work on farms located within the zone; the village of Pyla is famous for being one of the few remaining villages in Cyprus where Greek and Turkish Cypriots still live side by side. Other villages are Deneia, Athienou and Troulloi. Some areas are untouched by human interference and have remained a safe haven for flora and fauna. A buffer zone in Cyprus was first established in 1964, when Major-General Peter Young was the commander of the British peace force (a predecessor of the present UN force) set up in the wake of the inter-communal violence of the early 1960s. After stationing his troops in different areas of Nicosia, the general drew a cease-fire line on a map with a green chinagraph pencil, which was to become known as the "Green Line". It later transpired that the map General Young was using had been borrowed from Major Bill Garbutt of the 14th/20th King's Hussars, whose clerk, Lance Corporal Arnie Greenwood, had marked the cease fire line on the map with the only coloured writing instrument that he had, which happened to be green. A security zone of a size to be determined by representatives of Greece, Turkey, and the United Kingdom, in consultation with UNFICYP, was to be established at the limit of the areas occupied by the Turkish armed forces. This zone was to be entered by no forces other than those of UNFICYP, which was to supervise the prohibition of entry. Pending the determination of the size and character of the security zone, the existing area between the two forces was not to be breached by any forces. The UN Security Council then adopted the above declaration with Resolution 355. When the coup dissolved, the Turkish Armed Forces advanced to capture approximately 37% of the island and met the "Green Line". The meandering Buffer Zone marks the southernmost points that the Turkish troops occupied during the Turkish Invasion of Cyprus in August 1974, running between the cease fire lines of the Cypriot National Guard and Turkish army that de facto divides Cyprus into two, cutting through the capital of Nicosia. 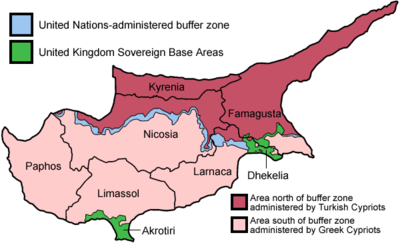 With the self-proclamation of the internationally unrecognized "Turkish Republic of Northern Cyprus", the Buffer Zone became its de facto southern border. Traffic across the buffer zone was very limited until 2003, when the number of crossings and the rules governing them were relaxed. The UN buffer zone is shown in light blue on the map. Starts at Kokkina exclave and covers approximately 90 kilometres (55 mi) to Mammari, west of Nicosia. Since 16 October 1993, it has been the responsibility of the Argentinian Contingent with approximately 212 soldiers. Sector One Headquarters and Command Company are located in San Martin Camp, which is near Skouriotissa village. Support Company finds its home at Roca Camp, near Xeros in the north. The two line companies are deployed along four permanently manned patrol bases while also conducting mobile patrols from the San Martin and Roca camps. Starts at Mammari, west of Nicosia and covers 30 kilometres (20 mi) to Kaimakli, east of Nicosia. Since 1993, it has been the responsibility of the British contingent, which deploys using the name Operation TOSCA. Starting at Kaimakli, east of Nicosia and covers 65 kilometres (40 mi) to the village of Dherinia, on the east coast of Cyprus and has been the responsibility of the Slovakian contingent, with 202 soldiers. After a nearly 30-year ban on crossings, the Turkish Cypriot administration significantly eased travel restrictions across the dividing line in April 2003, allowing Greek Cypriots to cross at the Ledra Palace Crossing just outside the walls of old Nicosia. This was only made possible after the decision of the ECHR (Djavit An vs Turkey, Application No.20652/92). Before Cypriot accession to the European Union, there were restrictions on Green Line crossings by foreigners imposed by the Republic of Cyprus, but these were abolished for EU citizens by EU regulation 866/2004. Generally, citizens of any country are permitted to cross the line, including Greek and Turkish Cypriots. A 2005 EU report stated that "a systematic illegal route through the northern part to the government-controlled areas exists" allowing an influx of asylum seekers. In August 1996, Greek Cypriot refugees demonstrated with a march against the Turkish occupation of Cyprus. The demonstrators' demand was the complete withdrawal of Turkish troops and the return of Cypriot refugees to their homes and properties. Among the demonstrators was Tassos Isaac who was beaten to death. Another man, Solomos Solomou, was shot to death by Turkish troops during the same protests on 14 August 1996. Aged 26, Solomou was one of many mourners who entered the Buffer Zone three days after Isaac's funeral, on 14 August to lay a wreath on the spot where he had been beaten to death. Solomou was fired upon by Turkish soldiers when he was climbing to a flagpole to remove the flag of Turkey. An investigation by authorities of the Republic of Cyprus followed, and the suspects were named as Kenan Akin and Erdan Emanet. International legal proceedings were instigated and arrest warrants for both were issued via Interpol. During the demonstrations on 14 August 1996, two British soldiers were also shot by the Turkish forces: Neil Emery and Jeffrey Hudson, both from 39th Regiment Royal Artillery. Bombardier Emery was shot in his arm, whilst Gunner Hudson was shot in the leg by a high velocity rifle round and was airlifted to hospital in Nicosia then on to RAF Akrotiri. The buffer zone between the checkpoints that divide Ledra Street was used as a space for activism from 15 October 2011 up until June 2012 by the Occupy Buffer Zone movement. Merlijn Twaalfhoven, did a project in Nicosia with musicians from both sides of the border. ^ "UNFICYP Background". UN.org. UN Peacekeeping. Retrieved 10 March 2016. ^ a b "About the Buffer Zone". unficyp.unmissions.org. United Nations Peacekeeping Force in Cyprus. Retrieved 10 March 2016. ^ Konyalian, Claudia. "Biodiversity in Cyprus 346 square kilometres Buffer Zone". undp.org. United Nations Development Programme. Retrieved 10 March 2016. ^ "UNSC Resolution 353 (1974)" (PDF). United Nations. 20 July 1974. Archived from the original (PDF) on 27 October 2012. Retrieved 4 July 2012. ^ "Tripartite Conference & Geneva Declaration". United Nations Peacekeeping Force in Cyprus. Retrieved 19 December 2011. ^ Necatigil, Zaim (2005). Kıbrıs uyuşmazlığı ve Avrupa İnsan Hakları Mahkemesi kıskacında Türkiye: Avrupa İnsan Hakları Komisyonu ve Mahkemesi'nde Kıbrıs Rum yönetimi ve Kıbrıslı Rumlar tarafından Türkiye aleyhine getirilen davalar [The Cyprus Conflict and Turkey in the grip of ECHR: Cases brought against Turkey by the Greek Cypriot Administration and the Greek Cypriots before the European Commission of Human Rights and the European Court of Human Rights] (in Turkish). Ankara: Turhan Kitabevi. p. 190. ISBN 9789756194348. ^ "Consolidated version of the Green Line Regulation including amendments" (PDF) (PDF). Council of the European Union. 17 February 2005. Archived from the original (PDF) on 4 February 2007. ^ "Antenna News in English 130896". www.hri.org. ^ Kessel, Jerrold (15 August 1996). "Cyprus conflict comes to a boil, U.N., U.S. fault Turkey for Greek Cypriot deaths". CNN. Archived from the original on 27 March 2007. ^ "Cypriots #OccupyBufferZone". The Stream. AlJazeera. 15 November 2011. Archived from the original on 8 April 2013. Retrieved 4 July 2012. Wikimedia Commons has media related to UN Buffer Zone in Cyprus. Wikimedia Commons has media related to Forgotten Architecture within the United Nations Buffer Zone.